what do you do with all your finished spools? Thread: what do you do with all your finished spools? I can't throw them away, after lots of machine quilting they really stack up.. Plastic, not wood any longer but thinking that there has to be a use for the spools.. Found mine ! I used only a few by comparison of what I own.. What do you do with you spools after quilting? Face stamps one side, opposite side the corresponding face printed on circle and both glued to spool. Last edited by chairjogger; 07-17-2013 at 09:50 AM. I don't have any problem throwing them away. I don't need more useless stuff in my life and house. Too bad the manufacturers don't print the recycling symbol on the spool to let you know if you can recycle them. Me too. Away with clutter. I throw mine in the recycle bin. We have one source recycling and everything goes together. I too have no problem throwing used spools away. But you may want to consider buying your thread by the cone instead of the spool if you do a lot of machine quilting. You are spending a small fortune on thread when it isn't necessary. It is much more economical to buy the large cones and very easy to adapt your machine to take them. You just need a coffee cup, a safety pin and some tape. I would like to know how to use a cone instead of spools. Could someone explain what to do with the safety pin and tape. I know the cone goes in the cup. I don't throw any spools away. There is a place here that takes all kinds of stuff like that. Teachers, troop leaders, etc.. can go in and get stuff for kids crafts. It is a really neat place. I try not to look at anything when I drop stuff off. I would hate to come home with more stuff! I purchase cones of thread and when they are empty, I make angles out of them......to give or sell. Put the cone in a coffee can or other container to keep it frome toppling over. Put the large safety pin over the thread post and thread the thread thru it and on to the rest of the way. Can also use a jumbo paper clip. My plastic spools I usually toss out. Sometimes I will whittle the top of one off and jam it into the bottom of a cone thread so it with sit on my old singer spool pin holder. Very cute idea for stamps - What is the actual stamping surface made out of? I make soap and do have one stamp for that, but it is a very solid material. I just gotta tell you that those are "happy spools". I collected for years till had had so many! Empty cones , spools of all sizes , finally I just tossed them out ! I figured after all those years and I still had not come up with a use... time to move on. Darn near filled the recycle bin. What a relief it was ! Your spool upcycling is very inventive and cute! I kept the 4 spools that came with one of my sergers, other than those, spools get pitched. One quilt store I went to sold empty plastic cones for use as a binding winder. I think they had a slot in them to hold the end of a binding strip. I also hate to throw stuff out, but am gradually learning to dump the clutter, so trying to get rid of stuff. I donate them to local Girl Scout troops, Nursing homes, and animal shelter. Kitties love playing with them. I also donate empty med bottles to the animal shelter to use to dispense meds to foster animals. I keep them in a basket in my sewing room for my 2 year old granddaughter to play with when she is in my sewing room with me. Sometimes it keeps her busy seeing how many she can stack up before they topple. I have mostly spools, but have no problem just tossing them. I toss mine into a large pop corn tin then when it's full I give them all to either the local boy scout troop or during the school year I give them to the local elementary school- those kids/teachers are pretty creative & find great things to do with them- they are always very happy to receive them. I heard a long time ago about a woman who had a bushel basket of empty spools in her estate sale. I started saving mine, thinking I would never have that many. I have them in several boxes now and I'm sure I have at least that many, maybe the second basket if I had them all together. Some day someone will talk about that eccentric old lady, "what was she thinking?" I still keep the wooden spools but toss the rest. I throw them away without a second thought. I've been getting rid of lots of stuff lately. There's a thread in the personal diary section of QB in which many people talk about downsizing and getting rid of stuff that they thought their children would want, but found out they didn't and things they thought they couldn't live without, but realized they didn't actually need. 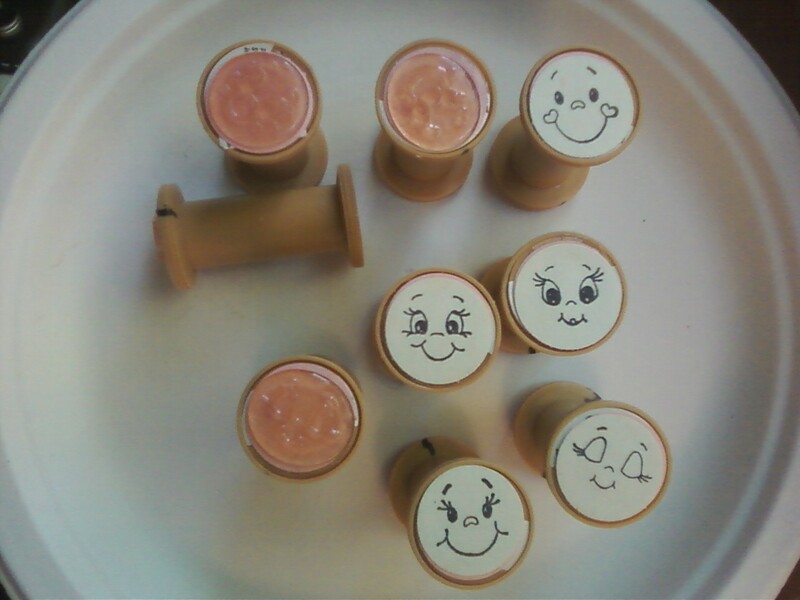 I had an idea in my mind to make a quilt portrait of "someone" and use the spools for curly hair. It would make it 3D and I thought a fun project. Didn't get around to it yet though, of course. If someone tries it please post it.